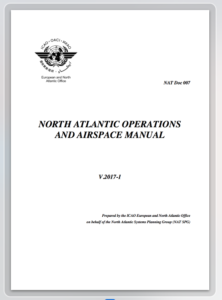 The 2017 version of NAT Doc 007, North Atlantic Airspace and Operations Manual, was published in January 2017 by ICAO/NAT SPG. Feb 15th, 2017 In the first six weeks of 2017 there have been some important changes on the NAT/North Atlantic. These are published in the latest edition of NAT Doc 007, January 2017. Datalink Mandate Exemptions: Announced January 2017, new exemptions for Phase 2B of the Datalink mandate, which will start on December 7, 2017 (FL350-390). Exempt: Tango Routes, airspace north of 80N, and New York OCA. 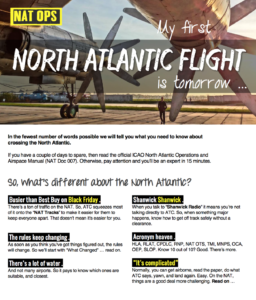 Feb 15th, 2017: FSB published the full NAT Crossing Guide “My first North Atlantic Flight is tomorrow“.